November 20, 2013  Typhoon Haiyan, like many disasters that preceded it, created a critical shortage of gasoline. 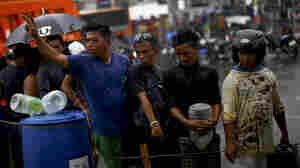 This hampered ordinary Filipinos trying to rebuild their lives, as well as aid organizations trying to help them. One U.S. group has made it its mission to provide free gas. November 19, 2013  Displaced typhoon survivors in Tacloban are still trying to get a handle on their lives being turned upside down. Many will be dependent on aid for months to come. November 18, 2013  As the recovery effort starts to move from rescue to reconstruction in the Philippines, one family in Leyte Province sees a dark future after the devastating loss they suffered from Typhoon Haiyan. November 18, 2013  On Sunday, people made their way to church through the rubble and debris caused by Typhoon Haiyan. 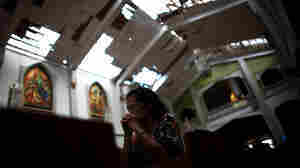 Parishioners say that in the days after one of the world's most powerful storms crashed into Tacloban, the church has been a focal point for the community, a place to be together and to mourn. November 16, 2013  In the typhoon-ravaged heart of the Philippines, many hospitals were badly damaged or destroyed by the storm. NPR photojournalist David Gilkey takes a look at one hospital that continues to operate despite a lack of food, water or medical supplies. November 16, 2013  Homes and businesses in the Philippines weren't the only buildings destroyed by Typhoon Haiyan last week. Hospitals in the city of Tacloban also took a direct hit. Doctors are doing what they can in their shattered buildings to aid the thousands of typhoon victims. November 15, 2013  It's been one week since the typhoon that destroyed most of the city of Tacloban in the eastern Philippines. People there are still in need of the basics like food, water and shelter. Almost every business in the city was shut down by the storm. November 14, 2013  Stories of survival are still emerging from the Philippines following the devastation caused by Typhoon Haiyan. 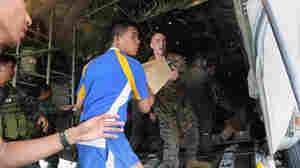 The U.S. military has been playing a major role helping the area recover. Survivors say if not for U.S. Marine transport planes, they would be trapped in Tacloban. November 13, 2013  Private entrepreneurs are attempting to offer low-cost, for-profit schools to some of the poorest families in the world. One school in Kenya promises a high quality education for just $5 a month. Do For-Profit Schools Give Poor Kenyans A Real Choice? November 12, 2013  American entrepreneurs in Kenya are attempting to fundamentally transform education for some of the poorest kids in the world — while making a profit. November 11, 2013  More than 600,000 have been left homeless and hungry by the devastating storm. In response, humanitarian agencies are mounting the largest relief operation since the Haitian earthquake in 2010. The biggest challenge right now is getting the basics — clean water and food — to the hardest hit areas. November 8, 2013  The recent discovery of polio in Syria and Israel should be a wake-up call to European health officials, scientists say. Low vaccination rates in some regions could offer the crippling virus a chance to reenter Europe and possibly gain a foothold. Vaccines used there also make it more likely that people can spread the virus. October 31, 2013  Health officials said that they were mistaken about a polio outbreak in Somalia spreading to South Sudan. Despite previous reports, South Sudan has not recorded any polio cases this year. The new information means that the spread of the virus around the Horn of Africa is more limited than previously thought. October 30, 2013  The number of polio cases globally sank to an all-time low in 2012. But outbreaks in Syria and Somalia this year are jeopardizing efforts to eradicate the virus. A recent visit to the Somali-Ethiopian border highlights just how easily polio can regain a foothold in rural, insecure communities. October 29, 2013  The World Health Organization has confirmed that polio has re-emerged in Syria for the first time in 14 years. Efforts are underway to immunize millions of children throughout the Middle East to try keep the virus from spreading.